Since the mid 1990’s, ground observers all over the planet have witnessed chemical aerosol deployments by the same high flying aircraft suggested by Wexler. Is this just a coincidence? Geoengineering is known to destroy the ozone layer and to increase the damaging UV-B Radiation. 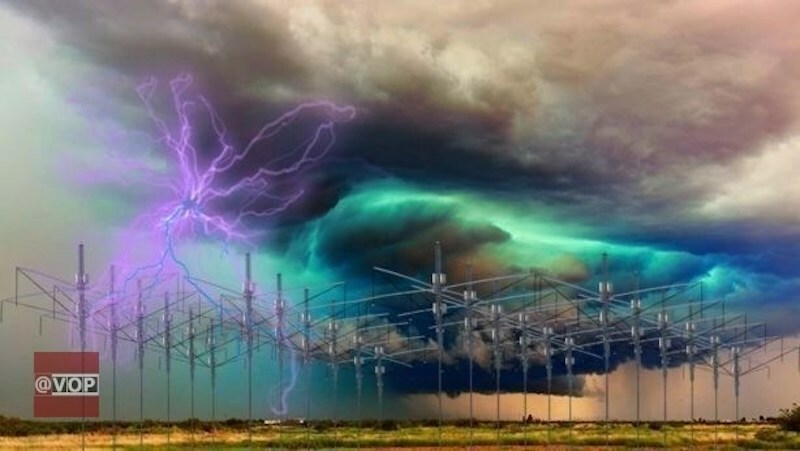 How much more evidence do we need to conclude that covert aerosol spraying of geoengineering chemicals, space rockets launches, ionospheric manipulation and microwaving the planet is the man-made CLIMATE CHANGE to fear most? We know that increased exposure to UV-B radiation has specific effects on human health, crops, terrestrial ecosystems, aquatic ecosystems, and biogeochemical cycles. (“Biogeochemical cycles” refers to the cycling of chemicals such as carbon and energy throughout the Earth system.) This article will touch briefly on these effects, then will explain what determines how much UV we are getting and how we know. The effects of UV-B radiation on human skin are varied and widespread. UV-B induces skin cancer by causing mutation in DNA and suppressing certain activities of the immune system. The United Nations Environment Program estimates that a sustained 1 percent depletion of ozone will ultimately lead to a 2-3 percent increase in the incidence of non-melanoma skin cancer. UV-B may also suppress the body’s immune response to Herpes simplex virus and to skin lesion development, and may similarly harm the spleen. Our hair and clothing protect us from UV-B, but our eyes are vulnerable. Common eye problems resulting from over-exposure to UV-B include cataracts, snow blindness, and other ailments, both in humans and animals. While many modern sunglasses offer some UV protection, a significant amount of UV can still reach our eyes in a high exposure situation. With regard to plants, UV-B impairs photosynthesis in many species. Overexposure to UV-B reduces size, productivity, and quality in many of the crop plant species that have been studied (among them, many varieties of rice, soybeans, winter wheat, cotton, and corn). Similarly, overexposure to UV-B impairs the productivity of phytoplankton in aquatic ecosystems. UV-B increases plants’ susceptibility to disease. Scientists have found it affects enzyme reactions that conduct fundamental biological functions, it impairs cellular division in developing sea urchin eggs, and it changes the movements and orientation of tiny organisms as they move through ocean waters. Since some species are more vulnerable to UV-B than others, an increase in UV-B exposure has the potential to cause a shift in species composition and diversity in various ecosystems. Because UV-B affects organisms that move nutrients and energy through the biosphere, we can expect changes in their activities to alter biogeochemical cycles. For example, reducing populations of phytoplankton would significantly impact the world’s carbon cycle, because phytoplankton store huge amounts of carbon in the ocean. Much of scientists’ work to determine the effects of increased UV-B on the marine biosphere has focused around Antarctica because the stratospheric ozone depletion there has been so dramatic, and because phytoplankton—which grow in abundance around Antarctica—form the basis of the marine food chain. Largely because of phytoplankton, oceans are responsible for the production of at least half of the organic material in the biosphere. In the Antarctic, increased exposure to UV-B radiation due to the appearance of the ozone hole commonly results in at least a 6-12 percent reduction in photosynthesis by phytoplankton in surface waters. In a study of California coastal waters, effects of current levels of UV-B radiation compared to historical levels range from 40 percent reduction of photosynthesis by phytoplankton to a 10 percent increase. 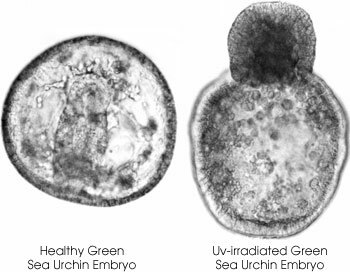 In fact, phytoplankton off the California coast sometimes turn out to be more susceptible to UV-B radiation than phytoplankton in Antarctica, to the surprise of biologists. Communities of plants, animals, and microorganisms may be more resilient than we yet know. In spite of increased ultraviolet exposure in Antarctica over the last decade or so, no catastrophic events have occurred at the ecosystem level. However, the reason for this may be that the large ozone hole lasts only from September to December and covers a small geographic region relative to the entire globe. If the ozone hole should remain for longer time periods, or if ozone were to be reduced over a wider area every year, sooner or later, we could expect to see major ecosystem changes. So many studies in both the laboratory and the field have demonstrated serious consequences of increased UV-B radiation on the biosphere that we need to improve our understanding of the complex Earth environment and its responses to that radiation.